With a little over 24 hours notice, Gadsden (Ala.) Regional Medical Center received 11 patients being evacuated from the Florida Keys' Lower Keys Medical Center Wednesday. Other patients in coastal Florida also were evacuated, with hospitals closing ahead of the hurricane's expected landfall on Sunday. 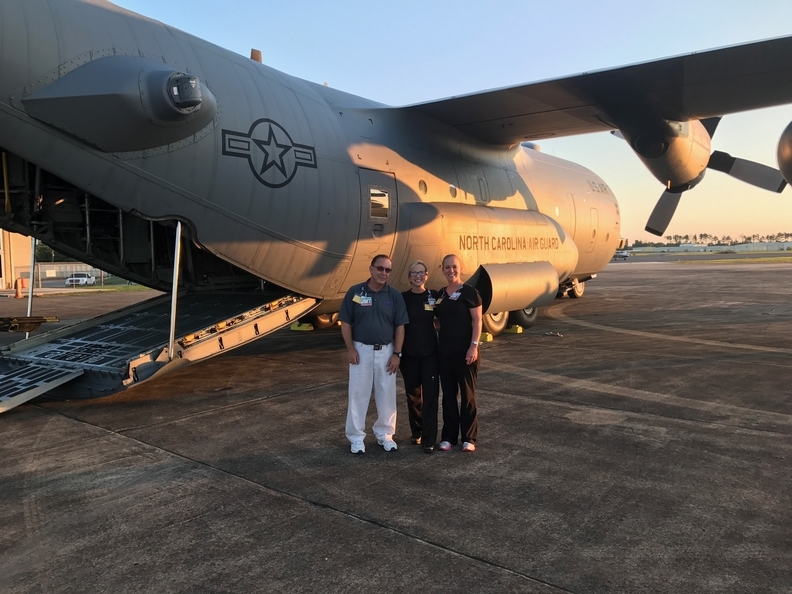 Gadsden, like other facilities admitting patients evacuated from areas hit by hurricanes, prepared for the arrival of its new patients by transport plane. Gadsden organized staff, got medical records in order and set up ground transportation. Coordination and communication between both Gadsden and Lower Keys Medical Center were essential, as people on both sides scrambled to fit together all the pieces to the puzzle of patient relocation. "It truly validates why we practice emergency management drills," Gadsden CEO Corey Ewing said of the last couple of days. As soon as the hospital learned on Tuesday that the Lower Keys Medical Center patients would be arriving the next day, it activated its disaster plan, which gave it a framework for the transition of care. At that point, Gadsden Chief Nursing Officer Martha Seahorn and the chief nursing officer at Lower Keys Medical Center began communicating, transferring a manifest of the patients and their diagnoses. Later, Lower Keys Medical Center provided more involved patient summaries and lab work. Each Lower Keys Medical Center nurse who was caring for evacuees called the corresponding nurse at Gadsden who would be taking over. "To have all the information that we received prior to their arrival had a huge impact on how quickly we were able to get them in and cared for," Seahorn said. For one, Gadsden, could make sure it had all the necessary medications on hand. Other hospitals also prepared their pharmacies, making sure they have enough medication on hand to last them two to three weeks. "We increase our usual inventory, knowing that we'll be receiving patients from the community," said Venessa Goodnow, director of pharmacy services at Jackson Memorial Hospital. Her hospital is part of Miami-based Jackson Health System, which has canceled appointments and closed its urgent-care centers. Her pharmacy is also taking in medications from nearby facilities that are closing, since it has greater refrigeration capacity, and processing refills early, so patients in the community don't run out of medications. Aside from making sure it had the proper medications ready, Gadsden also had to make sure it had the proper information. After getting initial facts about the incoming patients, it received paper charts for each of them also. Once those charts arrived, staff scanned them into Gadsden's electronic health record. They also uploaded images—sent on discs—to be incorporated into the medical records. This kind of preparation is familiar to Greg Haralson, CEO of Memorial Hermann Sugar Land and Memorial Hermann Southwest Hospital, since he just went through something similar when Hurricane Harvey hit Texas. Memorial Hermann Sugar Land evacuated, sending 74 patients to Memorial Hermann Southwest. For Haralson, the logistics were a bit simplified, because the transfers happened within a single hospital system. "We could put all the information together, which in many ways was the most important thing we did, and we kept the information in real time," Haralson said. Though the patient manifests were built through the EHR, which is the same system in both hospitals, documentation for the transfers themselves were on paper. But the EHR was still helpful, since it held the information Memorial Hermann used to stratify each patient by the most critical diagnoses. Though that information on the new patients came from the EHR, Memorial Hermann Sugar Land also kept copies of each patient's records on hand. "We wanted to have double documentation and not just rely on the EHR," Haralson said. Getting access to patient information has been harder for VillageMD Houston, a network of primary-care clinics that's seen a 40% to 50% increase in patient contact—patients who come in for visits and those managed over the phone and via a patient portal. "It's difficult to access medical records of patients you don't previously know," said Dr. Clive Fields, chief medical officer for the VillageMD network. "Interoperability is a huge limiting factor on the value of an EHR. These tragedies push to the forefront how we as a system need to demand information exchange." Luckily, his providers have "stepped up," he said. They've been managing patients over the phone and opening their offices early. Likewise, the staff at Gadsden made adjustments. By the time the Lower Keys Medical Center patients actually arrived at the airport, Seahorn and Assistant Chief Nursing Officer Rebecca Smith had given their team specific tasks, which they wore on name tags. "We wanted people to have clear roles and understand who was responsible for what," Smith said. They had also already identified which patients were at high risk for developing complications during transport. "We were able to have seamless communication and have people ready for any conditions that the patients were experiencing," Smith said. By 6 p.m. Wednesday, the patients had arrived at the hospital, and within an hour, they had all been admitted. "The nurses were ready to receive their patients," Seahorn said, "since they had already received reports and knew what to anticipate." That wouldn't have been possible if Gadsden hadn't received so much information about the patients ahead of time and coordinated with clinical staff, Seahorn said. "It was one of the most flawless transitions I have ever experienced in my career."